In this chapter, we present two versions of the multiple scattering (MS) theory in the real-space electronic Green’s function (GF) formalism: single-channel (MS-GF) and multichannel (MCMS-GF). While the first one based on the single-particle picture provides a tool for a precise description of MS processes, the second one allows us to take into account not only MS effects but also electron correlations and spin-orbit coupling on the same footing. Multichannel generalization of the MS-GF method relies on the Dyson integral equation relating the GF of a perturbed system with the GF of the corresponding unperturbed system. The second basic feature of the MCMS-GF approach is the use of the close-coupling method, which via Kohn variational principle for the reactance K-matrix gives rise to a set of the coupled integro-differential equations with the matrix of a potential. 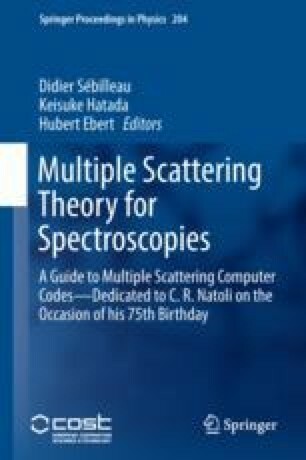 An iterative algorithm for solving this system has been developed to evaluate single-site multichannel scattering t-matrices through which the GF of the total many-atom system is expressed. In addition, some numerical aspects concerning the application of both versions are discussed with a focus on x-ray absorption spectroscopy. A.T. would like to acknowledge financial support from the Ministry of Education and Science of the Russian Federation (project 3.5398.2017/8.9). Parts of this work have been funded by European FP7 MSNano network under Grant Agreement No. PIRSES-GA-2012-317554 and COST Action MP 1306 EUSpec.